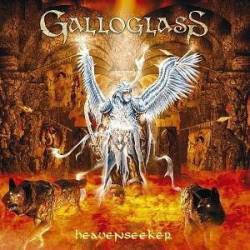 Normally I'm not too fond of melodic and epic power metal, but Galloglass from Hannover, Germany seem to be an exception. I liked already their debut Legends From Now And Nevermore quite a lot, and their new CD Heavenseeker doesn't disappoint either. Although Galloglass use very traditional elements so that parallels to Stratovarius or Hammerfall can't be avoided, there is much more to their songs than just the so-called true metal school. Galloglass are strongly influenced by what was called speed metal nearly twenty years ago and often remind you of early Helloween, Blind Guardian or Fates Warning. Perished In Flames is a wonderful song for every metal fan stuck in the past. The use of violins is another aspect which makes a difference between Galloglass and many other power metal bands. After Forever and Banished From Eternity are two tracks with a folk orientated sound. Yet the most important thing is the variation you find on this record. There are very fast and heavy songs surprising with rough vocals. The title track itself even shows some progressive metal elements. And Dawn Of A New Age is an epic metal masterpiece. Production and instrumentation are on a very high level. Especially the vocals which never reach for too high notes and the harmonic guitars make Heavenseeker a strong album. But it could even be stronger if Galloglass would do without the too traditional songs. They really shouldn't be afraid of putting more experimental ideas into the music because there doesn't seem to be a risk of failing.